The reference for the pecking bird comes from a twentieth century book on German toys. 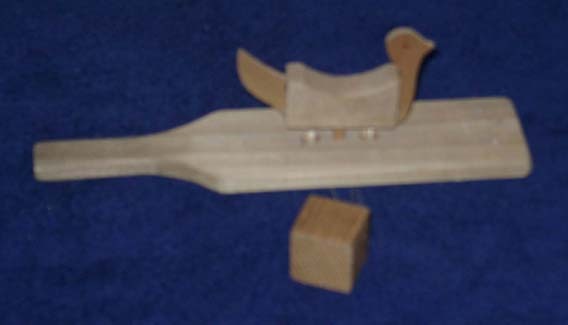 This toy and the following "pecking chickens" are engaging demonstrations of simple mechanics. To play with the toy, hold it by the handle and let the weight hand freely below. Move the toy forward and backward so that the weight swings back and forth and the bird's head will bob and its tail flip up and down.